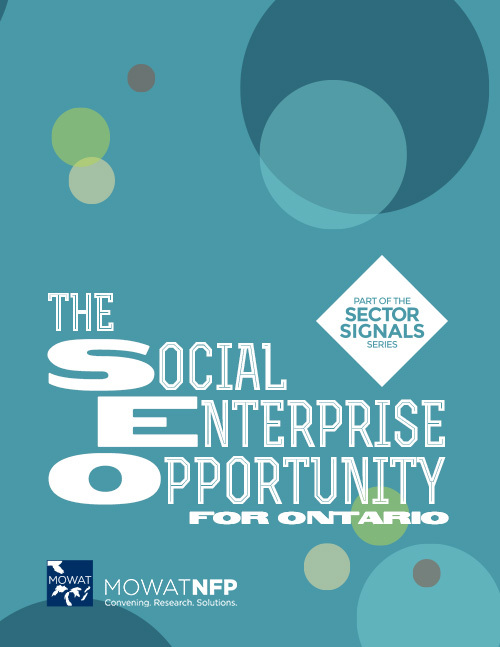 This Sector Signal explores the potential and viability of social enterprise for providing innovative and cost effective solutions to deliver on the promise of inclusive economies and resilient communities in Ontario. The term “social enterprise” carries particular meaning in particular contexts. In the broadest sense of the term, it means a business activity that produces a social benefit. Early examples date back to the 19th century with the founding of Goodwill Industries in Boston, cooperatives serving local community needs have been an important part of the social economy of Canada for decades. But the concept and practice have become the focus of significant attention for the not-for-profit, private and public sectors in recent years. With support from the Ontario Ministry of Economic Development, Trade and Employment (MEDTE), Mowat NFP developed this Sector Signal to explore opportunities for social enterprise in Ontario today, and ways the Ontario government can be an effective partner in building its success. Recognizing the depth of experience, knowledge and wide variety of perspectives on social enterprise across different stakeholder groups, this was not an exercise in consolidating existing research. Rather, it was a process of reading the barometer of opportunity and identifying pragmatic and strategic ways forward in strengthening the social enterprise landscape in Ontario. In developing this Sector Signal, multiple stakeholders and thought leaders were consulted, casting a wide net to focus the discussion on both short- and long-term actions and strategies. Through a set of key informant interviews, two multi-stakeholder roundtables, and a province-wide webinar, the context of the existing ecosystem of social enterprise in Ontario was explored and opportunities for strengthening the environment were identified. Several themes emerged from the consultation process. This report distills these themes and consolidates a range of options for moving forward the goal of creating a vibrant social enterprise space that enables enhanced impact for Ontario communities.